Dr. Robert Fungo, Lecturer-Department of Food Technology and Human Nutrition, CAES, Makerere University. 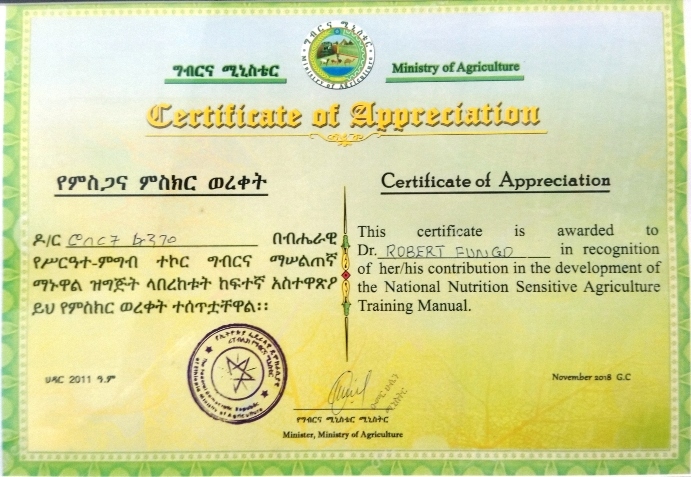 Dr. Fungo was recognized by the Federal Government of Ethiopia for his contribution to developing the National Nutrition Sensitive Agriculture Training Manual. (PHOTO/COURTESY). 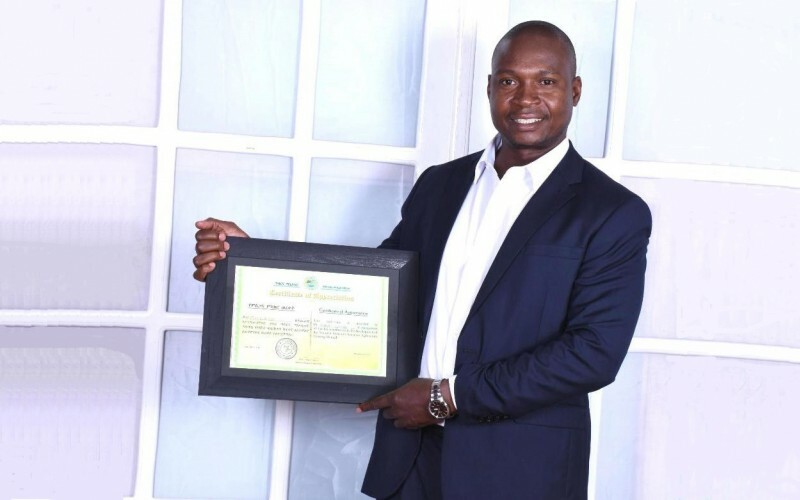 KAMPALA – Makerere University lecturer Dr. Robert Fungo has received a Certificate of Appreciation from the Ethiopian Government through the Federal Minister of Agriculture. Dr. Fungo was recognized for providing expert support to the Government of Ethiopia to develop a nutrition training manual for grassroots Agriculture Extension Officers. “The Ethiopian Government through the Federal Ministry of Agriculture and Natural Resources has recognized you for your significant contribution in the development of the training manual of Kebele Agriculture Extension Workers. Your expertise in how to integrate nutrition indicators and activities in the training manual is appreciated by the government”, part of the message sent by Tamene Taye read. Tamene Taye is a senior nutrition expert, a professional educator and advisor on nutrition to the Ethiopian Ministry of Agriculture. The certificate awarded to Dr. Fungo by the Federal Government of Ethiopia. Dr. Fungo thanked his lecturers for the mentorship. “The Ethiopians, who I supported to develop nutrition-sensitive agriculture training guidelines for Extension workers and the Nutrition Sensitive Agriculture Strategy, have recognized my efforts. I thank Prof. Muyonga who mentored me.” Dr. Fungo said. Dr. Robert Fungo is a Lecturer at the Department of Food Technology and Human Nutrition, Makerere University School of Food Technology, Nutrition and Bio-Engineering. His teaching, research, and community outreaches in the field of Applied Human Nutrition, Food Science and Food Technology. As a Nutritionist & Food Technologist, he is interested in understanding the influence of agriculture and food systems on the nutrition and food security of women and children in low and middle-income African countries (LMIACs).